Rex and I are still trying to lose weight and actually eat better so when I saw the Super Swizz Spiral Slicer I knew it would be perfect for us. 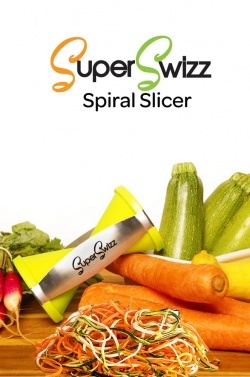 What the Super Swizz Spiral Slicer does is cuts raw vegetables into pasta shaped spirals. It is great for cutting firm vegetables like carrots, zucchinis and cucumbers. The slicer is so easy to use – it is like a pencil sharpener. You put the vegetable in one end and twist. Out comes a long curly strand of your vegetable. It would be great for salads, stir fry and even use in place of pasta. I made a great salad with carrot, cucumber and jicama by just adding a bit of a ginger dressing I had on hand. It was light and refreshing. You can purchase your own Super Swizz Spiral Slicer HERE. You will love how easy it is to use and the low calorie dishes you can make.